The rainbow has millions of colors which cover the visual spectrum. However, most people see a smaller number of colors. I learned seven colors in school, and they are easily remembered using the acronym ROY G BIV. There are probably other ways to remember the colors, but this works for me. Below are the colors of the rainbow with the RGB - red/green/blue - color values. Some of these are included on the RGB color wheel, but indigo and violet are included here. Some Christians believe that because of the end of the world is near, there is no need for conservation. It is permissible, in their minds, to rob the earth of natural resources without any thought to the preservation the environment for future generations. However, this paradigm is not supported by the Bible. I believe the Bible lays out a clear case for why we need to conserve resources, even if the world ends soon. Below are four principles which advocate for an environmentally friendly, conservation approach to taking care of our home, the earth. Numerous texts state the true ownership of the earth: it belongs to God. Psalm 24:1 The earth is the Lord's, with its fullness; the world, and those who dwell therein. Colossians 1:16-17 For by him all things were created, in the heavens and on the earth, things visible and things invisible, whether thrones or dominions or principalities or powers; all things have been created through him, and for him. He is before all things, and in him all things are held together. Leviticus 25:23 The land shall not be sold in perpetuity, for the land is mine; for you are strangers and live as foreigners with me. Logical follows that if the earth and everything in it belongs to God, our position is to care for what has been entrusted to us. Genesis 2:15 The Lord God took the man, and put him into the garden of Eden to cultivate and keep it. Genesis 1:26 God said, "Let us make man in our image, after our likeness: and let them have dominion over the fish of the sea, and over the birds of the sky, and over the livestock, and over all the earth, and over every creeping thing that creeps on the earth." Jeremiah 2:7 I brought you into a plentiful land, to eat its fruit and its goodness; but when you entered, you defiled my land, and made my heritage an abomination. Several verses specifically call on us to learn from nature. How can we learn from the natural world if it is destroyed? Job 12:7-10 But ask the animals, now, and they shall teach you; the birds of the sky, and they shall tell you. Or speak to the earth, and it shall teach you. The fish of the sea shall declare to you. Who doesn't know that in all these, the Lord's hand has done this, in whose hand is the life of every living thing, and the breath of all mankind? 1 Chronicles 16:33 Then the trees of the forest will sing for joy before the Lord, for he comes to judge the earth. Matthew 6:26, 28 See the birds of the sky, that they don't sow, neither do they reap, nor gather into barns. Your heavenly Father feeds them. Aren't you of much more value than they? Why are you anxious about clothing? Consider the lilies of the field, how they grow. They don't toil, neither do they spin. Perhaps a more controversial principle, do not use resources to excess. In the mid nineteenth century, the buffalo was almost hunted to extinction in the United States. Thousand of pelts were shipped to the eastern, more industrialized part of the United States for use as belts in machinery, clothes, and decoration. Numbers 35:33-34 So you shall not pollute the land in which you are; for blood pollutes the land. No atonement can be made for the land for the blood that is shed in it, but by the blood of him who shed it. You shall not defile the land which you inhabit, in the middle of which I dwell; for I, the Lord, dwell in the middle of the children of Israel. Ezekiel 34:18 Does it seem a small thing to you to have fed on the good pasture, but you must tread down with your feet the residue of your pasture? and to have drunk of the clear waters, but you must foul the residue with your feet? Deuteronomy 20:19 When you shall besiege a city a long time, in making war against it to take it, you shall not destroy its trees by wielding an ax against them; for you may eat of them. You shall not cut them down; for is the tree of the field man, that it should be besieged by you? In 2016 I kept a journal on a daily basis. Below is part of my introduction and some information on my printing process. When I was in elementary school, my parents gave me a small diary, complete with a little lock and key. I made some entries, but my older brother made fun of my keeping a diary, and I quit writing. I don’t think my entries were in the style of “Dear Diary,” but even with straightforward writing, I stopped. For the past ten years I have been maintaining a planning journal with events and notes. These are a great record, and I have frequently referred back to these journals for information. Last year I wrote a memoir of my life as part of a writing challenge and used my planners to create timelines that, otherwise, I would not have been able to recall. In the fall of 2015 I found myself interested in developing another writing challenge. 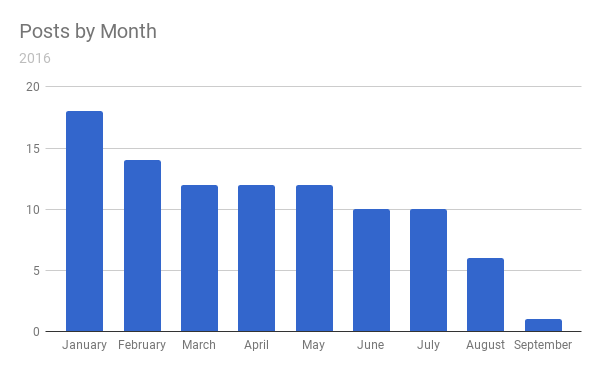 I decided to write 1,000 words per day for a total of 365,000 words written by the end of 2016. At first I planned to base the entire writing plan on creating an e-book every week, and developed several possible topics and seven part outlines (for 1,000 words each day). 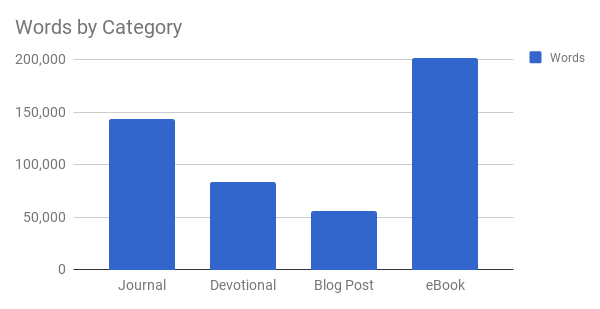 However, as 2015 counted down, I decided instead to focus my writing in four categories: e-books, devotional thoughts, blog posts, and a journal. Initially my goal was to write 250 words per day in each of the four categories. Writing 250 words per day for 365 days translates into 91,250 words, approximately 350 pages. Thus, starting with January 1, 2016, I faithfully wrote a journal entry every night. I skipped a handful of entries, but wrote about most days. Davy Crockett was an earlier frontiersman in the United States and represented the state of Tennessee in the U.S. House of Representatives for several terms between 1827 and 1835. When he lost in 1835, Crockett famously quipped, "I told the people of my district that I would serve them as faithfully as I had done; but if not, they might go to hell, and I would go to Texas." This state has been rewritten as a pithier, “You can go to hell; I shall go to Texas,” and adorns a variety to items in Texas-based airport gift shops. I titled my journal “I Shall Go To Texas,” because I only lived in Texas during 2016. For a handful of years I needed to live in the Arkansas and Texas area for family reasons. The result is the book you see pictured below. The total number of words was 143,193, which worked out to be 583 pages. I wanted a paper version of my journal, and because it was meant only as my own record, I printed it at Lulu.com. Lulu is a publishing platform which allows you to print a small number of books, or you can utilize Lulu’s publishing services to maximize revenue and distribution. I set up the pages in Microsoft Word, converted them to PDF, and uploaded the files to Lulu. A few weeks later, I received the printed version of my journal in book form. I encourage you to write on a daily basis. Journals are excellent records of activities through the years. Every day I receive coaching tips from Hilton Johnson Productions. At the time of this writing, the company’s website appears to be down. However, I still receive tips daily. I have a folder in my email where I save any tips that I like. From my saved tips, the ones below are my favorites for 2016. Giving a presentation without having a new sales recruit watch or hear you do it is a waste of energy, talent and valuable training time. I love the idea of always being in training mode. What can you learn from a given situation, and what can you teach others? What's 80 times more effective than cold calls? I’ve heard a similar statistic for bringing to members in a church. Mailing out invitations to an evangelistic meeting is not nearly as effective as “friendship evangelism.” Personal connections make a difference in the effectiveness of your presentation. People who spend their time multi-tasking are not as creative, productive, or happy as someone who is totally focused on just one task at a time. Studies have shown that multi-tasking consists of rapid switching back and forth between activities. It seems simultaneous, but it is not. One of the best ways to learn a good presentation is to write the language down on 3x5 cards, take a few of them with you wherever you go, and memorize them one at a time. A 3x5 card is the ultimate paper app. You can write and draw on cards, easily rearrange them, and access them without technology. Using 3x5 cards is effective when learning a new presentation as well as for any type of information that needs to be learned. The most powerful thing you can do to get people to take action is to create emotion within them. You do that by asking questions that get them thinking and talking. Create multiple income streams by speaking, training, making online programs, coaching, publishing and providing tools for others to succeed. This is an inspirational goal for me. This is similar to the idea of transmedia, but with more structure in a way that can be monetized. You can ask all the questions you want (even personal ones) in your presentation by simply asking permission to do so before you begin. Here's what you say: "It would be helpful for me to understand more about your situation. May I ask you a few questions?" Teachers have used questions for thousands of years. Socrates introduced this concept into the Greek philosophy. In the book of Genesis in the Bible, older than Socrates, God used questions when speaking with Adam and Eve, and again when addressing Cain after he murdered his brother. Jesus frequently used questions to engage his listeners. Learn to be a good speaker. You'll get to make multiple sales with a single presentation. Before offering the benefits of your products or services find out if your potential prospect has problems that your products or service will solve. That way you'll only give presentations to people who are interested and qualified. Create a "Keepers File". When you read articles, find quotes and discover ideas you like, put them in the file for reference. They are a great resource for writing articles, training classes and stimulating your imagination. I have read this same suggestion in the writings of Jim Rohn, John Maxwell, and others. For a few years I pasted articles or rewrote article summaries into a spiral bound notebook. Now I save many articles electronically or make a note in my planner. Jesus asked many questions to engage his listeners and test the understanding of his followers? He also used questions as a way to introduce a topic of conversation or solicit specific information. Please read each passage where these verses are located for the context, but by simply reading through this list of questions, I believe you will see several different applications you may also be able to apply as you teach, present, and talk to others. Matthew 5:46, 47 - If you love those who love you, what reward have you? Do not even the tax collectors do the same? If you greet your brethren only, what do you do more than others? Do not even the tax collectors do so? Matthew 6:25 - Is not life more than food and the body more than clothing? Matthew 6:26 - Are you not of more value than they? Matthew 6:27 - Which of you by worrying can add one cubit to his stature? Matthew 6:28 - Why do you worry about clothing? Matthew 6:30 - Will He not much more clothe you?